San Francisco, CA & Dublin, Ireland; Monday 1st December 2014: Windows 8.1 has broken the 10% mark and overtaken XP for the first time globally in terms of internet usage according to StatCounter, the independent website analytics company. The report from the company's research arm, StatCounter Global Stats shows that in November, Windows 8.1 at 10.95% narrowly beat XP to second place, pushing it to third at 10.69%. Windows 7 remains the most popular operating system on 50.3%. 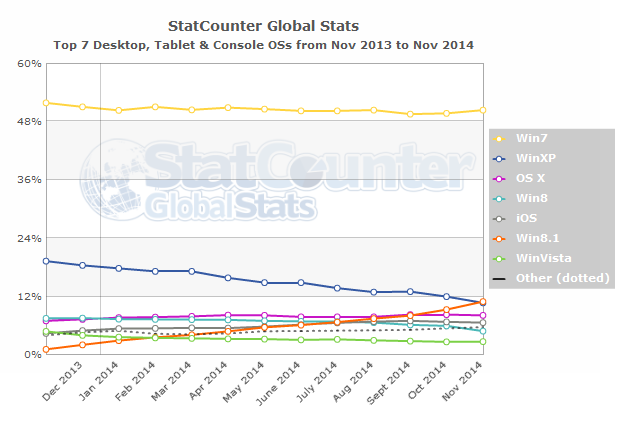 In the UK, where Windows 8.1 overtook XP in April, XP has declined to 4.2% while Windows 8.1 is currently at 13.2%. Windows 7 is number one on 40.4%. (Other country analysis available on http://gs.statcounter.com/#os-ww-monthly-201311-201411).